Great deal if you have that $79 order in mind. A Sav sounds like a winner. I have a birthday code plus a giftcard so why not? I got that email. What do these goodie bags contain typically? Thanks. No "War Horse" condoms? They told me they were going to include War Horse condoms. I finally loaded up on some of the cob's I've been wanting to round out the purchase. Good times. Are the War Horse condoms scented or flavored? Asking for a friend. Warhorse condoms worked too well I am afraid. I just called P&C. This offer is not valid if you got in on the most recent goodie bag. I went from a 200.00 order to 80.00 after I found that out. Yes, but not in the vanilla/cherry way. Great news, Russ. Thank you. P&C found all 200 misplaced Goodie bags inside of a single War Horse condom. In my experience, goody bags usually have quality contents worth something, often $15-$30, occasionally more; I've not had one from PC, but from pipe shows. Missed it, which is probably a good thing anyway, since I just had a nice fat box from SPC arrive two days ago. Susan doesn't complain, but I do try not to abuse reasonable numbers of tins coming in the mail..
My "Goodie bag" is scheduled for delivery this Saturday. I'll post a picture when it arrives. Oh, you're no fun, you just fall right over. The P&C Goodie bag arrived a day early. Everything cigar related will be given to my son who is a cigar smoker. Not a bad deal considering I was planning on ordering a pipe anyway. Perfect timing. I am waiting for thread from the guy who didn't want a goody back. We had one a few years back that was priceless! Sadly the War Horse condom was about as successful as the War Horse tampon sold under the slogan 'Put some nicotine in your woman' and was a complete marketing flop for some reason! OK, I'll admit I am not drawn to the above assortment. Don't do cigars and already have a life time supply of pipe cleaners. Plenty cigar cutters and bottle openers. Several tobaccos I would not smoke. The Tervis tumbler would be good! Still, a goodie bag is "a good thing®". It seems to me the last few goodie bags have moved more towards the side of "let's clear the warehouse of inventory that is not selling". 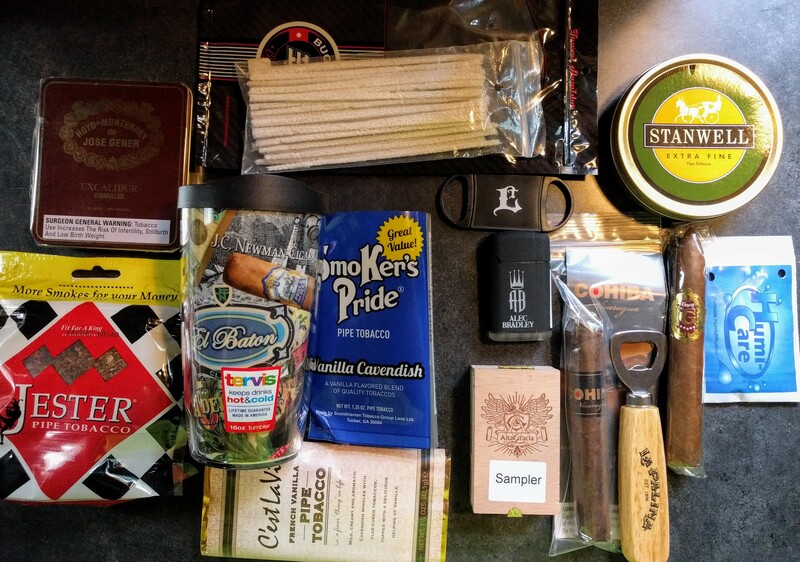 There are several cool items in the above picture, but then there is the bag of Jester "pipe tobacco". The Jester is not pipe tobacco, it's RYO cigarette tobacco, that is mislabeled for the tax dodge. I'm not convinced any pipe smoker would actually want it. I would, however, gladly smoke the cigars, and that Tervis mug is sweet! I kept the Stanwell Extra Fine, C'est La Vie, the Tervis tumbler, pipe cleaners and bottle opener. All of the cigar related items I gave to my son. I sent Dave Shain ("shaintiques") the Jester, the Smoker's Pride and some other tobacco I'm not smoking for his Free Pipe cause. Considering it's all free I still think it's a good deal. Wow, that looks like quite a haul to me. These may have been overstocks or shelf-worn to PC, but I think at the usual asking price, it would have been quite a bit. If you needed to place a $79 order anyway, this was a bonanza. However you tally up that stash, subtract that from the $79.